Per my geeky husband, this past Wednesday was Pi Approximation Day, 7/22. According to him, it was a special day "because a common approximation for pi is 22/7." Right, I knew that. So of course I had to make an approximation of a pie. 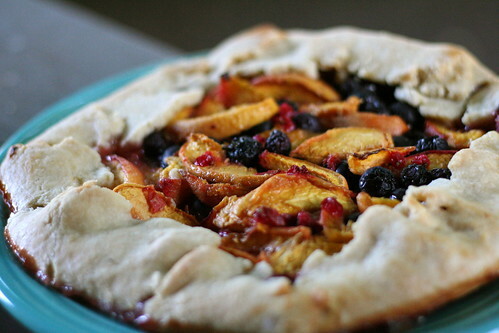 Meet my rustic fruit tart, otherwise known as a galette or crostata. 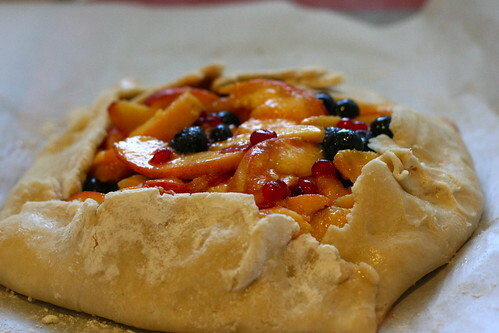 For the filling, I used peaches, blueberries, and redcurrants (yes, redcurrant is alloneword). This was my first time using redcurrants. They're lovely little fruits, but I don't adore them quite as much as other berries. They remind me strongly of pomegranate seeds without the extra crunch. 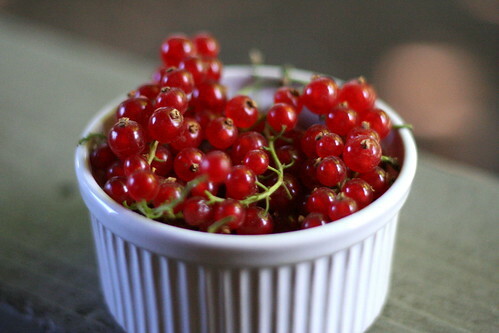 I'm glad I tried them though; I've often seen beautiful photos of redcurrants by other food bloggers like Helen at Tartelette and Aran at Cannelle et Vanille and have always wanted to taste some myself. I've decided that "rustic" desserts are right up my alley. I don't need to worry about precision because they're meant to look a little unfinished, and the priority is on the flavor. That's really where I'm finding my baking groove... I tend not to enjoy the decorative, presentation aspects of cooking and baking quite as much as the 'making it taste good' part. This tart definitely fit the bill. 1. Process the flour and salt together in a food processor until combined. Scatter the butter pieces over the top and pulse until the mixture resembles coarse cornmeal, about 15 pulses. Continue to pulse, adding the water through the feed tube 1 tablespoon at a time, until the dough comes together and forms a ball, about 10 pulses (Amy's note: I needed many more than 10). 2. Turn the dough and any crumbs onto a sheet of plastic wrap and flatten into a 6-inch disk. Wrap the dough tightly in the plastic wrap and refrigerate for 1 hour. Before rolling out the dough, let it sit on the counter for 10 minutes to soften slightly, about 10 minutes. 1. Adjust an oven rack to the middle position and preheat oven to 375F. Roll the chilled dough out into a 12-inch circle between 2 sheets of floured parchment paper. Slide the dough, still between the parchment, onto a large rimmed baking sheet and refrigerate until firm, about 20 minutes. 2. Toss the berries, stone fruit, sugar, lemon juice, cornstarch, and cinnamon together in a large bowl. 3. Remove the top sheet of parchment paper from the dough. Mount the fruit in the center of the dough, leaving a 2 1/2 inch border of dough around the edge (Amy's note: be careful not to pour in any excess fruit juice that remains in the bowl. It will flood your tart.) Being careful to leave 1/2 inch of dough around the fruit, fold the outermost 2 inches of dough over the fruit, pleating every 2-3 inches as needed. 4. Bake until the crust is golden and crisp and the fruit is tender, about 1 hour, rotating the baking sheet halfway through baking. 5. Let the tart cool slightly on the baking sheet for 10 minutes, then use the parchment paper to gently transfer the tart to a wire rack. Use a metal spatula to loosen the tart from the parchment. Let the tart cool on the rack until fruit juices are thickened, about 25 minutes. Serve warm or at room temperature. So one thing Amy didn't mention here that was one of the yummiest parts for me was the serendipitous fruit glaze on the bottom outside of the crust. You can see it in the first photo. It gave the otherwise bready crust a nice sweet finish. Surprisingly, it came about because the fruit juices overflowed in the oven, and the crust was kind of sitting in them, so they gelled into that nice glaze. Can this girl do any wrong??? Uh, yum! Can I repost this on Honeysuckle? You said it Andy! This girl CAN"T do anything wrong! Love this dessert. I may have to make this one for my Mom and Aunt in August! i am DEFINITELY making this YUMMY dessert next week for a dinner party! but, i just may have to come to eugene to get fresh berries!! I am not related to you and can say that this tart looks incredible!! I don't even know what a redcurrant tastes like, but I love the peach/blueberry combo! Great job!! !